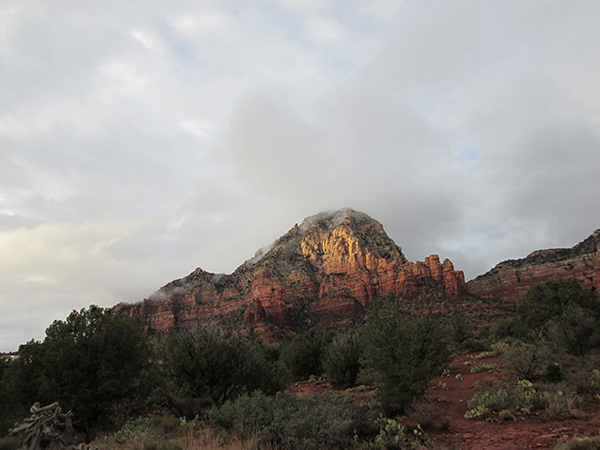 Cloudy days can be creepy here. 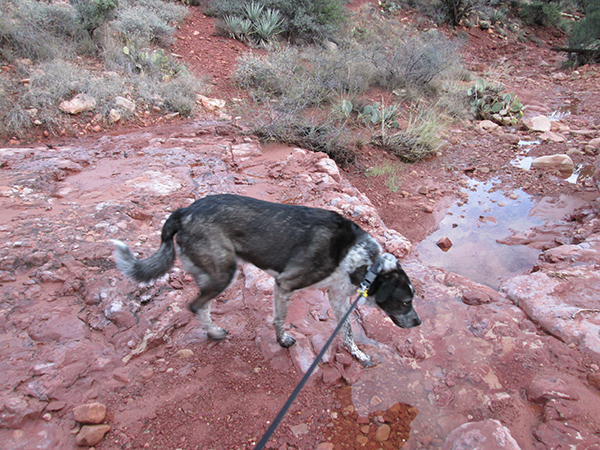 You never know what you might step on when you’re creeping along in a wash. Person, you put up the wrong picture. I don’t get creeped out in my wash. I like stepping in puddles. Put that other picture up. The light goes away on cloudy days. Or it’s up way too high to reach. I can find my way by smelling things. I don’t care if there’s not much light. You’ve still got the wrong picture, person. That’s better. That’s what I’m looking for. That looks like you got some black dots on your lens. I think you need to clean your camera, person. I think you cleaned your camera the wrong way. Now those black dots are bigger. Oh yeah, that’s what I was talking about. 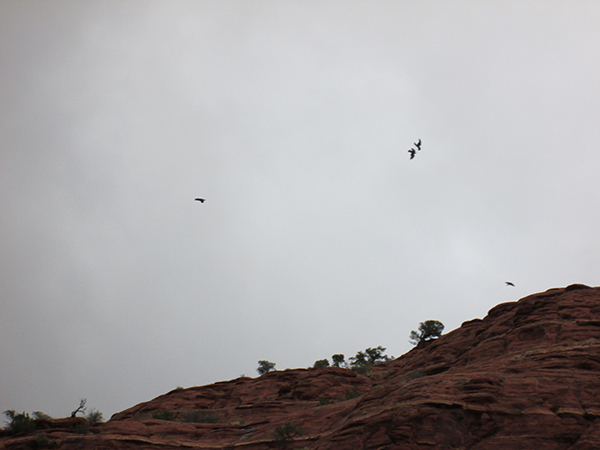 On cloudy days the ravens fly low over that rock on my trails. They always look like they’re up to no good. At least they don’t come down and dive bomb me but they sure flock together on days like this. 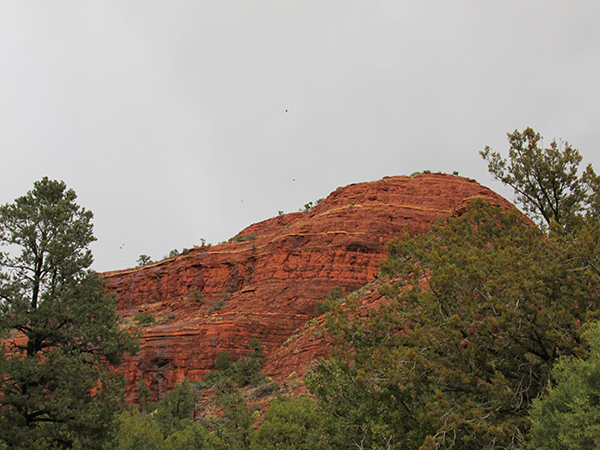 I tried to talk to those ravens and find out what they were doing up there. I even threatened to get my Detective Dog hat and investigate. I don’t think those ravens understood what I was saying to them, because they kept repeating the same word over and over again. That is creepy Bongo! Wooo! Ku, those ravens are good for giving out creeps. Patrecia, I think it would take a large flock of the ravens on my trails to lift me up. And then I’d bite. Oooh, tasty! Maybe they too don’t like thunder, Bongo… but I hope this rain will be with no thunder! Thanks Marina. My person left me in dog jail for the most horrible thunder storm last week, but the clouds the last few days have only brought rain. Ravens! *shiver* Are they like buzzards? I’m pretty sure they would try to kill me. Yikes. Cupcake, ravens are worse than buzzards because they eat live and dead things. Don’t worry though. I’ll protect you from those nasty ravens. Thanks Chancy and Mumsy. Those ravens don’t seem very good at listening. All they want to do is make cawing noises – when they aren’t saying “Nevermore,” that is. Happy Thanksgiving to you. Oh no….those ravens are very creepy……..I wonder what they were doing up there, too….hopefully they won’t come back again…. Kevin, I think those ravens lied because every time we have a cloudy day they all hang out there and fly around. I don’t know where they go when the sun comes out because when it’s sunny there are usually only one or two ravens flying around. Kari, the skies cleared up. We had the most awesomely gorgeous day today. Thanks Little Binky. 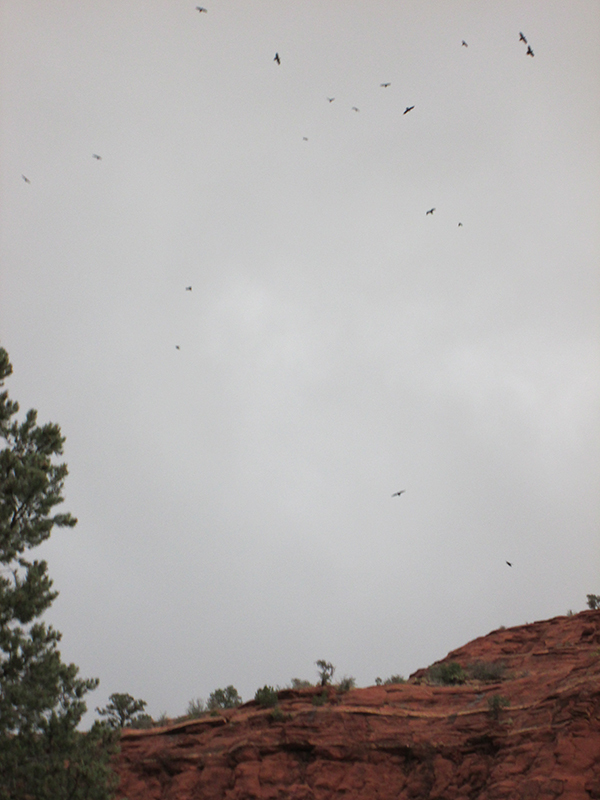 At least those ravens are mostly flying way up high. I forgot what the sun looks like Bongo…rain and even snow. Not enough snow to have fun in but enough mud to get my feet wiped off every time I come in. I don’t like getting my feet wipes, do you? Lola, I wish I could get just a little bit of snow to play in. We haven’t had any yet, but I guess I can’t complain. I haven’t had to have my feet wiped. It’s awful Bongo! I can wipe them myself on the rugs so why does Diane have to chase me around with a towel? You’d think the rug would do just as good a job. Well it does so I’m not sure what the problem is.